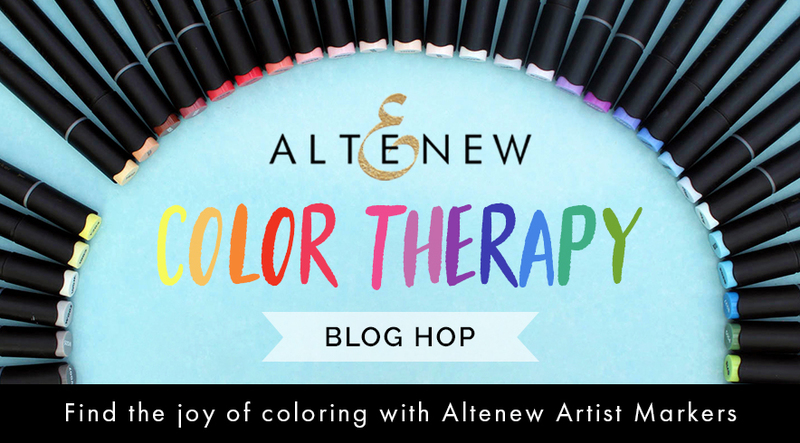 Welcome to the Color Therapy Blog Hop at Altenew. 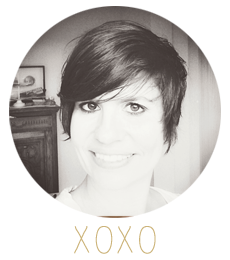 If you have hopped over from Justine Hovey's blog you are right on track. This is the layout I created for my blog post. I used the Ditsy Print Stamp set to create a background on a piece of leftover white smooth cardstock. The I used the Altenew Alcohol markers to colour the flowers and leaves. I picked out Frayed Leaf and Forest Glades for the green hues and Buttercream, Mango Smoothie, Lavendar Fields and Soft Lilac for the yellow and purple tones. I used the design to set off the title which I created with the Alphabet stickers from the Reflection Scrapbook collection. Then I created layers with different patterned papers from the Reflection and Our Family Scrapbook collections. I'm giving away a 20$ gift voucher to the Altenew Store. Leave a comment here on my blog by July 17th. I'll announce a winner around 5pm CET. Another gorgeous layout, Lilith! You make it look so simple to have gorgeous scrapbooks. This is beautiful, Lilith! It’s perfectly balanced, wow. the layering of the colors is so pretty. 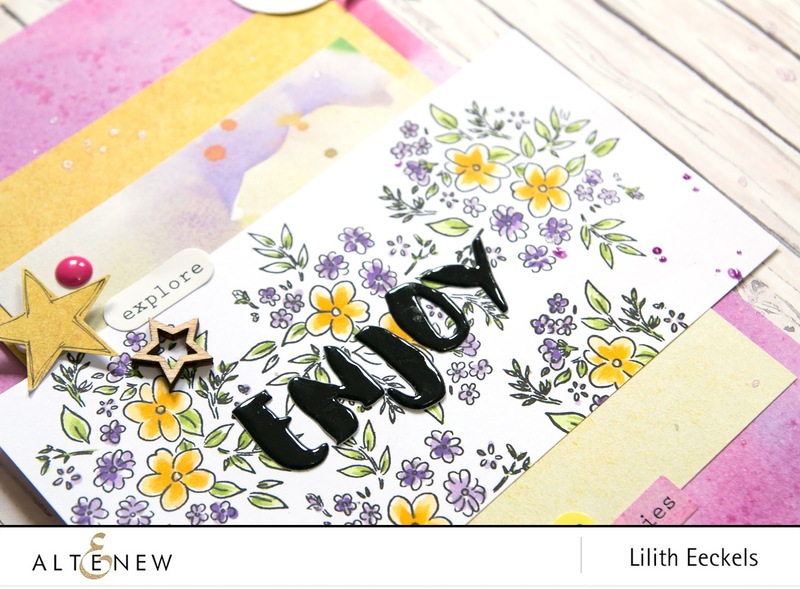 Lovely layout using some of the fun products from Altenew! I love seeing your layouts! So creative. Beautiful colors! Beautiful layout, inspires me to use more of my stamp sets when I'm scrapbooking. Cute layout. Glad to see I am not the only one that still scrapbooks. Most people I use to follow have stopped and gone off to do other things. The background and detail is incredible! Lilith, I think this layout is just lovely. I also love the one that you had done with the heart earlier....You are very talented....thank you so much for sharing! BEAUTIFUL scrapbook page layout! I just love all the colors and patterns and layering going on with it!! Very pretty layout! I love the ditsy print stamps and how you coloured them in! Colouring is so much fun, and I would love to get more markers to play with! Such a sweet layout! Love the print you created with the Ditsy Print set. Love the way you used your new markers, the colors are nice and gorgeous! So pretty. Just what I am looking for for an idea I have. Thanks! I loved your scrapbook layout using stamps and markers to enhance your background. Thanks for the inspiration. Gorgeous layout! Love the beautiful layering! What an adorable layout! So colorful and creative! Another beautiful layout by the very talented Lilith! LOL You make it look so seamless and easy. Just beautiful! I want you to know,Lilith, that I just adore your layouts and have been pinning them all along! You inspire me and though I am making more cards in the last years, I am a scrapbooker at heart and am still amazed at your heavenly inspiration! Love today's piece and especially the pic! Love the use of the ditsy print! The colors you used certainly pop! Great job ~ L.W. Beautiful layout! I love that you chose the whitewashed boards background! The colors you used for your flowers is perfect! Thanks for the inspiration! Love how you colored these pretty little flowers! Beautiful job! This is a beautiful layout. I love the design of the layout, it's interesting' fun and not too much! Beautiful layout! I love the scrapbook layouts are included in hops. The work is so beautiful and unique. Purple and yellow are so beautiful together and you did an awesome job with these flowers! Love it! I love the ditsy floral stamp! It's one of my favorites because you can use just about any color combination and it looks beautiful. The purple and yellow is fantastic! Such a sweet layout! What a wonderful layout you've created. Love how colorful it is with the new markers! After seeing all the lovely pages you do I have started doing the odd page again. Your layouts are so fresh and colourful. Gorgeous layout that so beautifully enhances that sweet photo. Lovely coloring and color palette. Gorgeous colors for this pretty project! Love the layout; love that you mixed items from past and current releases. Wow, love your layout and the pretty color combo and layering. Beautiful page, I love the colors, and the flower image that you chose. Thank you so much for sharing. Just beautiful! Thanks for some awesome ideas! Thanks for sharing your lovely and creative layout! Great job on the page, makes me want to get back into scrapbooking! Hi Lilith! I love your layout...so clean, fresh and crisp! I really liked the way you repeated color and shape to highlight that little man in your life :) Thanks for sharing! luv this. not too busy. I like the layers on your layout. What a gorgeous layout! Your layers highlight the photo wonderfully and your colors are so lovely. Thanks for the inspiration. Gorgeous coloring, love how you combine it with the pattern papers to make your fabulous page. Fabulous design Lilith! Lovely coloring! Thanks for this second project for the hop! I love your mini book with the cross-stitch butterflies! You are so talented! All your work is beautiful!! I love following you & seeing all your work! You are an inspiration!! Thank you! !